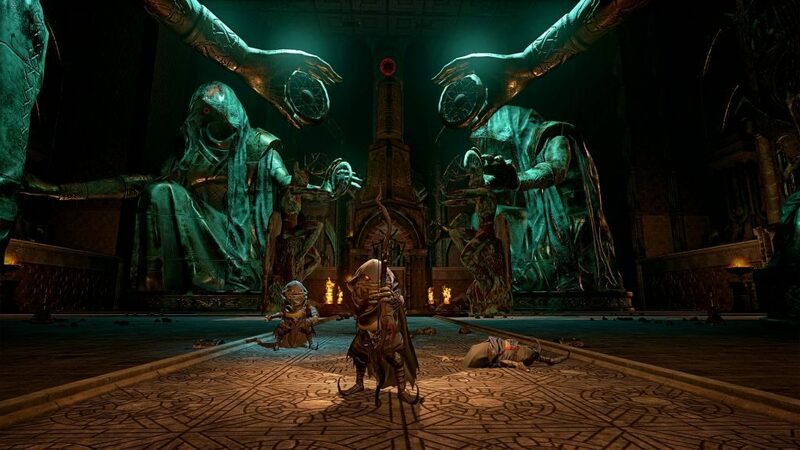 The Mage’s Tale, the new PlayStation VR dungeon crawler set in the universe of inXile’s The Bards Tale series, is full of fiddly little technical issues that hold it back from greatness. Story in The Mage’s Tale is light, but fun. Players take on the role of an apprentice to the great Mage Alguin who, after some jackhole upstart wizard named Gaufrol kidnaps the boss, is called upon to save the day. Accompanied by Alguin’s familiar, Annoying Green Guy (not his real name), the apprentice delves into sewers and dungeons in an attempt to figure out how to save Alguin. Annoying Green Guy is with you for most of your journey. Offering snide tutorial advice at first, guiding you through the basics; including the magic system, which is one of The Mage Tale’s best features. But, after a while, he’ll simply show up at random intervals to sputter around and generally get on your nerves. The player starts the game with just a basic fireball that can be tossed around at will. But as the first dungeon progresses, various spell component reagents are discovered. When you teleport back to your home base (which you can do whenever you want), these reagents can be tossed in a cauldron with the fireball spell to add interesting and fun effects to the basic spell. Before long, you will have a green fireball that does extra damage and bounces around the room. In addition to reagents that enhance your magic, you also gain access to other elemental spells. Lightning, ice, and wind fill out your spell book, and each is able to be enhanced with the reagents you’ll continue to discover throughout the game. Overall, the magic system in The Mage’s Tale is fun and intuitive. Once you have the basics in place, you can quickly and easily toggle between the spells: a quick press of a button on the Move Controller brings up a floating menu, and you just sort of gesture towards the spell you want to use. Which is crucial as battles are fast and dynamic. Each base spell has its uses. Fire will set foes alight for damage over time; ice will freeze enemies in place, which is useful because they tend to move around the battlefield so much that its easy to lose track of them; lightning quickly became my go-to damage dealing spell; while wind will blow enemies backwards (off of cliffs, if you are lucky). 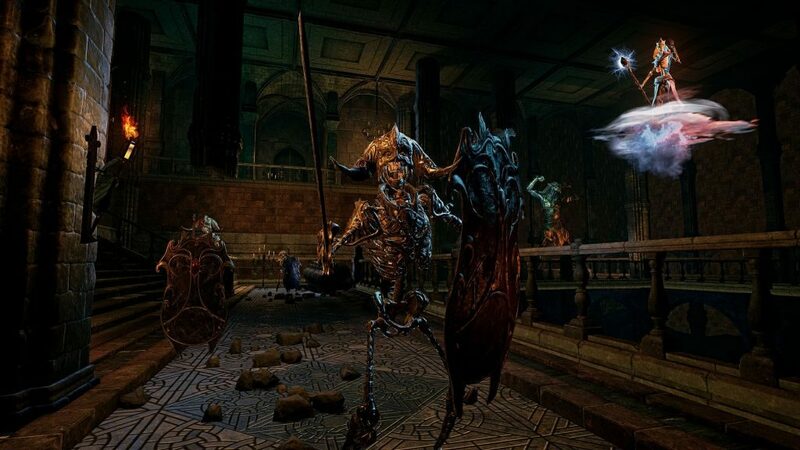 When you enter a chamber inhabited by enemies, the game announces it by blocking off the exits and shifting to the game’s “exciting” battle music. Foes appear in waves, usually on the other side of the chamber. Wipe them out, and the next wave appears. When you have defeated everyone, the music changes, the exits open, and you receive experience points for the battle. Since the movement is primarily teleportation-based (there are also small stepping options that I totally ignored), you can pretty easily avoid getting hit by projectiles and teleport out of harm’s way. Just don’t let yourself get cornered or disoriented, because enemies will swarm you if they get the chance. 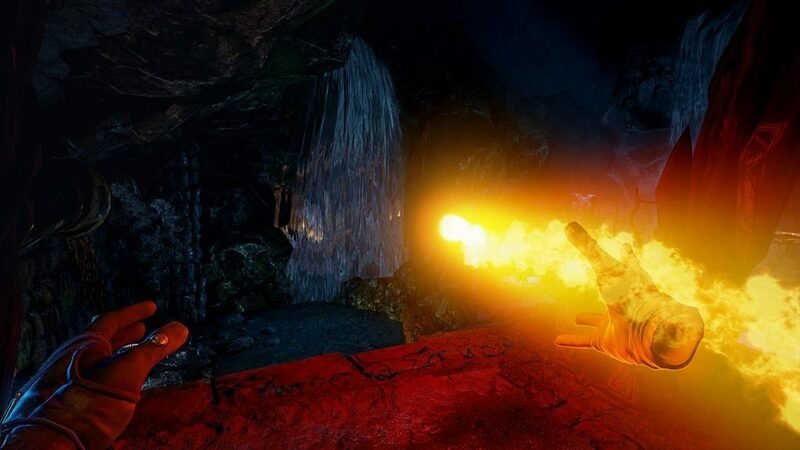 If you’ve played the VR versions of Killing Floor or Doom, combat in The Mage’s Tale will be a snap. In addition to their practical functions in battle, the spells are also useful when it comes to solving the game’s many puzzles. Alongside magic, the puzzle system was easily the highlight of The Mage’s Tale for me. Puzzles are a mix of environmental manipulation and magic. You might have to shoot an ice javelin into a waterfall to freeze the flow of water, for example, then turn a crank to lower a bridge into the area where the water previously flowed. Finding the right combination of magic and environmental manipulation to solve the pervasive riddles that are in almost every chamber of every dungeon never felt tedious or tiring. Indeed, solving these mysteries is hugely satisfying. Solving puzzles is sometimes necessary to progress in the story, but many puzzles are there just for fun. In fact, there are quite a few puzzles that are hidden in plain sight as you progress through sewers and caverns. 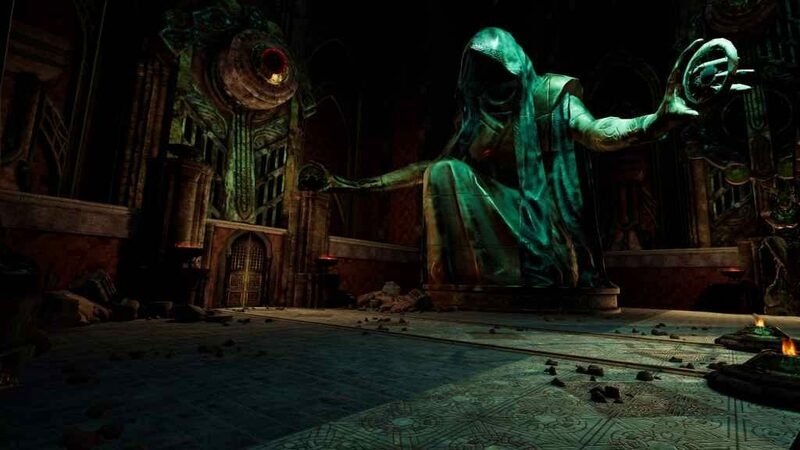 It is quite possible to run right past many of these optional puzzles, but doing so would rob you of some of the game’s best moments. For example, in one tunnel early on, I noticed that there was a place for a widget to be placed in a wall. With no widget readily available, I took note and moved on. A few chambers later, I came across an odd spot in a wall. Fiddling with it, I opened a secret chamber that I could have easily missed (even Annoying Green Guy commented that he didn’t realize it was there). Solving a few more puzzles, I was eventually rewarded with a secret chest. And, laying unobtrusively in the corner, was a widget that looked an awful lot like the one that was missing from the wall earlier. There is no end to the crazy stuff you find in this game. This hallway? Not crazy. But near something crazy, probably. Long story short, I took the widget back, inserted it into the wall, opened a second secret chamber, and solved another puzzle to reach the end point of this second area. The final reward for all of this running about? A tiny man on a table did a catchy two-minute song-and dance number about the joys of drinking whiskey. So yeah, this game has some genuinely cool and goofy secrets. I would feel bad for spoiling that moment, but touches like the little dancing guy are literally everywhere in The Mage’s Tale. When you discover a spell component, for instance, you don’t merely tuck it into a pouch and continue exploring. Oh, no. That’s too pedestrian. In The Mage’s Tale, a magical levitating frog on a pillow appears behind you, inviting you to chuck the component into his gaping mouth. After which he teleports it back to the lab, because, you know…magic and stuff. The Mage’s Tale is a cool, weird and witty game; one makes me hoot with delight at least once every five minutes. Which is why it’s kind of shame there are some technical issues holding it back. To start with the most obvious and egregious issue, the visuals just aren’t that great. Looking at screenshots taken from The Mage Tale’s Oculus release, everything looks crisp and clean. 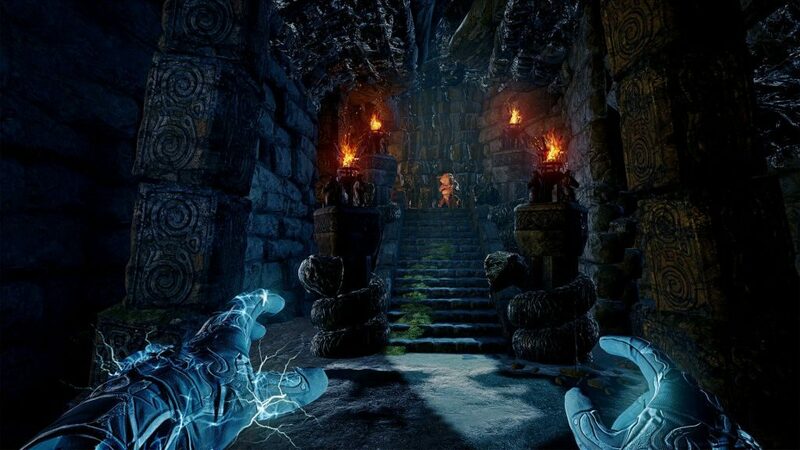 But somewhere in the transition to PSVR, it seems that The Mage’s Tale has taken a major hit in the visual department. Playing on a standard PS4, environments are muddy and dark. Even in well-lit areas everything looks a little fuzzy. I found myself continuously adjusting my headset to try to find the sweet spot, even though I knew I was already in it. As a result, details get lost in shadowy corners, which, in a game almost entirely comprised of shadowy corners, is a bit of a drawback to say the least. 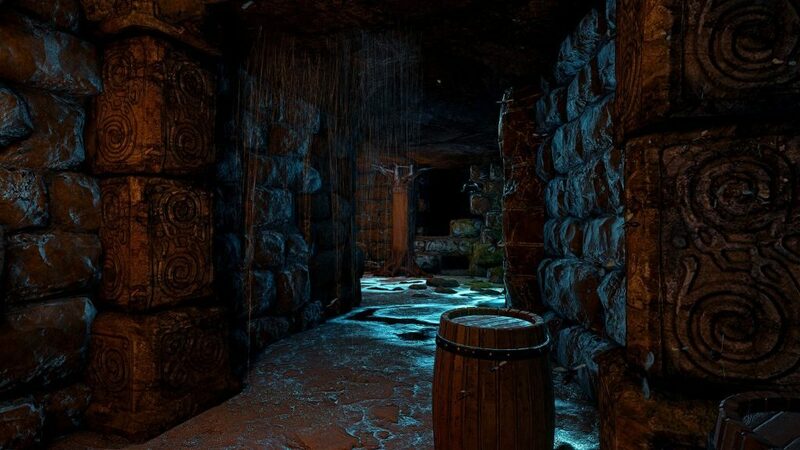 It’s a shame this murkiness is so pervasive, because the actual design of the dungeons is stellar. Giant statues loom overhead, ancient bridges swing across chasms; its all very impressive. If only you could see it clearly. And, unfortunately, these issues impact the battle system. Enemies like to run into dark corners and lob arrows and projectiles at you. But, because everything looks like you’re wearing glasses coated in Vaseline, I found myself following projectiles back to their point of origin, aiming lightning in that general direction, and hoping for the best. Not a huge deal, as battles are rarely difficult. Nevertheless, it’s still extremely frustrating to get cheesed by some chump that you simply cannot see. That being said, inExile has announced it will be patching in PlayStation Pro support, post-release. This should clean things up quite a bit – if you own a PlayStation Pro. I also had a lot of issues with the handling of objects. Picking stuff up from the floor is a giant hurdle that VR games need to overcome. It seems that every other game I review, I’m complaining about grabbing stuff off the floor, and I’m afraid that The Mage’s Tale doesn’t do much to move the needle on this issue. It’s supposed to work like this: you point your hand at an object that you want to grab, and then it lights up a bit to let you know that it’s ready. Then you pull the trigger on the Move Controller and the object magically floats up to your hand. Neat! Or at least it would be if it functioned as intended. In reality, it works like this: you point your hand at an object and nothing happens. So, you wiggle your hand at the object in an attempt to get the game to recognize that you want to grab it and five other objects lying about light up, excluding the one you actually want. At this point, you stand up out of your chair and bend down to the actual floor so you are actually running your in-game hand through the in-game object. You can’t pick it up, but it flickers a bit, so, you jump around, contorting your body and swearing like a sailor, and eventually, finally, the damn thing floats into your hand. You grip the trigger on the Move Controller for dear life, because God help you if drop the thing. Despite these rather significant issues, The Mage’s Tale is a lot of fun from beginning to end thanks to its light-hearted, bizarre-o sense of humor, ridiculously fun exploration, and spectacular puzzle design. 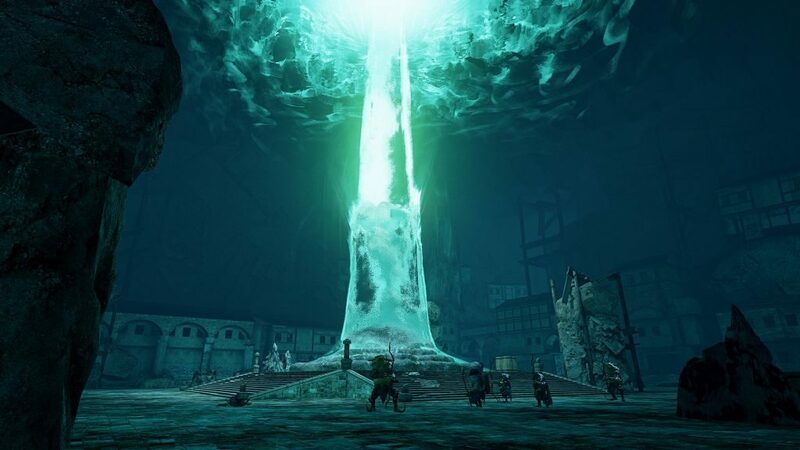 Games like this are sorely missing from the PlayStation VR’s library, and with 10 dungeons to explore, The Mage’s Tale delivers a boatload of fun for RPG fans. I’m hoping that inExile patches things up a bit over the next couple of weeks, but even if they don’t, The Mage’s Tale is still pretty great. If only they could add a way to mute Annoying Green Guy. He’s the worst.